Glendale Park is a 7.2 acre park located at 1375 West 1700 South, just west of the Seven Peaks Water Park and located in the West Salt Lake Planning Area. The park is a central community location for residents from the Glendale, Poplar Grove, and Rose Park neighborhoods and is also easily accessible from the regional trail on the Jordan River. Over the last several years, the park’s tennis courts, restroom facility, and irrigation system have been redeveloped. 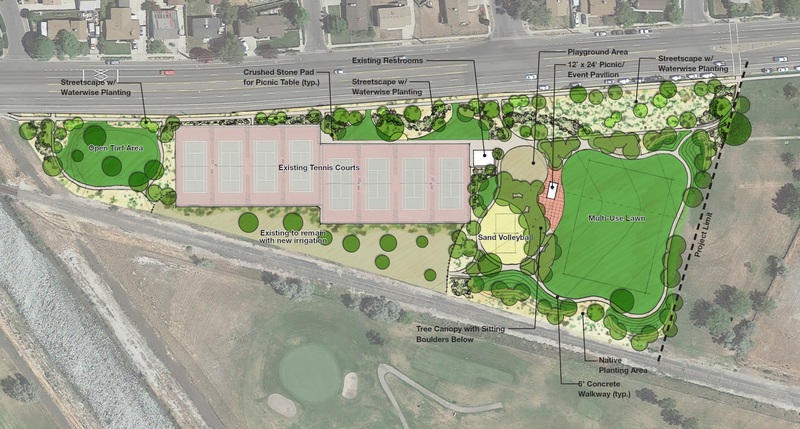 In the fall of 2018, Salt Lake City Council approved funding for the final phase of park improvements which will include a small multi-use field, looped walking path, pavilion, and playground. These improvements will create a space for recreational and social events in this neighborhood. Salt Lake City Parks and Public Lands has contracted with a landscape architecture consultant to develop design drawings for the improvements, which will be implemented and completed by the summer of 2020. Salt Lake City Parks and Public Lands, in collaboration with the Arts Council, is pleased to provide an opportunity for artists and artist-led teams to submit qualifications for the Glendale Park public art project.This project will allow the opportunity for the artist or artist-led team to collaborate and consult with the contracted landscape architecture consultant to integrate artwork and concepts into the overall renovations of the park. This RFQ is open to all professional artists and/or artist-led teams residing in the United States regardless of race, creed, gender, gender variance, sexual orientation, national origin, age, religion, marital status, political opinion or affiliation, or mental or physical disability. To be considered, artists must have demonstrated experience accomplishing work of similar scope and scale for Utah’s variable climate. Utah artists are strongly encouraged to apply as well as artists with expertise in community engagement. Meets all public safety, structural, and maintenance standards and complies with the Americans for Disabilities Act (ADA), Salt Lake City requirements, and all other applicable laws, codes, and regulations. The total budget is $188,500 and inclusive of artist’s fees and related expense for design, supplies, fabrication, insurance, transportation, travel, permits, and installation. Any fees incurred for design/artwork related engineering, electrical, infrastructure modifications and assistance from the contractors shall be the responsibility of the artist. The artist is strongly encouraged to include a contingency plan of at least 10% of the project’s commission in the budget for their final proposal. Dates are subject to change except the application deadline of Thursday, May 9, 2019. The Salt Lake Art Design Board, in consultation with project stakeholders, will review all of the properly submitted applications and will recommend one artist or artist-led team, and one alternate, for the commission to the Mayor for final approval. Only the selected artist or artist-led team will enter into a design agreement with the City. The alternate will enter into a design agreement only in the case that the proposal submitted by the primary selected artist is not accepted by the Art Design Board and the Mayor of Salt Lake City. Artist has created works of permanent nature that do not require excessive maintenance or repair costs and meet public safety requirements, Salt Lake City requirements, and Americans for Disabilities Act (ADA) standards. Artists may apply individually or as a team. Artists interested in this project must prepare and submit all of the following information and documentation via the CaFÉ™ website no later than 11:59 p.m. MDT on Thursday, May 9, 2019. There is no application fee to apply or to use the CaFÉ™ online application system. No other method of submission will be accepted. Incomplete applications will NOT be considered. The applicant’s name must appear on all materials submitted. Please upload Letter of Interest, Resume/CV, and References in one (1) PDF document, and include Images of Recent Work in the "Choose Work Samples" section of the application. LETTER OF INTEREST: A letter not to exceed one page (500 words) outlining your interest in this project and qualifications or experience working on comparable projects of similar scope and scale. Letter must include address, email, phone number and website of artist. CURRENT RESUME OR CV: A resume not to exceed two pages (1,000 words). Including artist training and professional experience. If submitting as a team, submit a resume for each team member. ​PROFESSIONAL REFERENCES: A list of two (2) prior permanent public art project administrator references with contact information (name, title, organization, mailing address, phone number, and email address), the name and location of the artwork in which you worked with the administrator. References are not to exceed one page. IMAGES OF RECENT WORK: Complete all fields in the CaFÉ™ portfolio seciton and upload through the "CHOOSE WORK SAMPLES" section. A minimum of 5 and maximum of 10 jpeg images of installed past work of similar scope, scale, and budget. Ten images per application, not per team member. Artists who wish to submit kinetic, sound or media works must submit a complete CaFÉ™ application and include links to the work uploaded online, such as YouTube or Vimeo. Instructions on how to format images to CaFÉ™ specifications may be found at www.callforentry.org/imaging_tips.phtml. Assistance in using the CaFÉ™ system is available during regular business hours by calling 303-629-1166 or 888-562-7232, or via email at cafe@westaf.org. The artist/team selected for the commission will sign an Artist Design Agreement and a two-party Artist Commission Work Agreement with Salt Lake City Corporation. The selected artist/team must carry general liability and auto insurance, and must either provide proof of Workers’ Compensation Coverage or apply for a Workers’ Compensation Coverage Waiver. The artist/team must submit engineering drawings for approval prior to the start date of fabrication. Examples of the two agreements can be found here. Once the selected artist/team and the City enter into a design agreement, the selected artist/team will participate in at least two (2) site visits. The first of the two site visits is meant to orient the selected artist/team with the project, meet with and ask questions to Parks and Public Lands, the contracted landscape architecture consultant, and other project stakeholders. The artist/team will work closely with the contracted landscape architecture consultant in developing their integrated proposal, with the guidance of the Public Art Program Manager and Parks & Public Lands team. During the first site visit, the artist/team will also have the opportunity to hear from and ask questions to the community and to develop their community engagement strategy. The artist/team’s community engagement can be accomplished in the first visit. They are also invited to make additional site visits to conduct in-depth community engagement and outreach. Successful proposals will incorporate insight from the community. During the second site visit, the artist/team will present their conceptual proposal to the Salt Lake City Art Design Board and project stakeholders. The site-specific proposal should convey their ideas and plans through scale designs, renderings and/or scale models with a statement that describes, in detail, the project’s intent, proposed materials, fabrication and installation methods, project schedule and an itemized budget. For the first visit, the selected artist will receive a $2,000 travel stipend which is inclusive of travel expenses, hotel, meals, etc. For the second visit, a $4,000 travel stipend and honorarium will be awarded to the selected artist for their proposal and is all inclusive of design, travel expenses, shipping, etc. and will be distributed in two payments. The selected artist must email a color rendering of the proposal to Kat Nix, Salt Lake City Public Art Program Manager, by Thursday, July 25th, 2019, by 5:00 p.m. MDT. Materials will be distributed to the Design Board and Parks and Public Lands project partners prior to the finalists’ presentation. The $6,000 total stipend and honorarium will be deducted from the total commission amount of $188,500. After the artist/team’s proposal is accepted by the Mayor of Salt Lake City, the artist/team and the City will enter into the second two-party agreement. The selected artist/team will be required to provide General Liability and Auto insurance as specified in the Agreement. The selected artist/team will be required to be present for installation and to remain on site for the duration of the installation, which will be coordinated by the Public Art Program Manager and Parks and Public Lands. The artist or artist-led team will be responsible for all expenses incurred for travel for the installation of the artwork and should budget accordingly from the awarded commission. The Public Art Program, which commissions artists' work for City-owned buildings and public spaces, was established by ordinance in 1984. The Salt Lake Art Design Board is an advisory group of citizens representing different City Council districts, appointed by the Mayor and confirmed by the City Council, to oversee Salt Lake City’s public art program. They are selected for their related arts expertise and willingness to serve the community. The Design Board is directed, by ordinance, to select artists for public art commissions in Salt Lake City and recommend those artists to the Mayor for final approval. The current Design Board members include Libby Haslam, Jann Haworth, Nancy Rivera, and Larissa Trout. The Design Board will consult with representatives from SLCDA to help inform their artist/team selection for this project. The Salt Lake Art Design Board and Salt Lake City Corporation reserve the right to reject any or all applications, to reissue the Call for Entries, or to terminate the selection process or project at any time without prior notice. No applicant shall have the right to make a claim against Salt Lake City Corporation in the event the RFQ is canceled, or the City decides not to proceed with the selection or commissioning process, awards a contract, or determines not to award any or all contracts specified in this document. No protests will be accepted or reviewed. All submissions are subject to City Code 2.44, governing conflicts of interest.